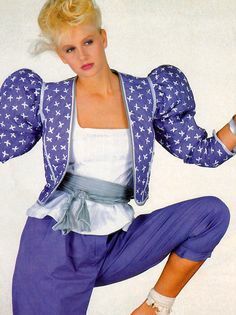 Once I hit high school I frequently dressed, I suppose, like Bowie in the Ashes to Ashes video.. a bit of a toned down version though 😉 Jeanne-Marc was this amazing designer in San Francisco and I was lucky enough to receive several jackets and tops from them. Purple taffeta with over-the-top balloon/puffy shoulders (similar to this but more extreme) super tight sleeves ending in black lace, with a corset-like many buttoned bodice, worn with olive drab culottes, furry mauve knee socks and beige wicker dance shoes…rainbow streaky eye shadow to my eyebrows with smudged black under my eyes. Yeah- a 1980 Bowie fashion victim was I. It felt like a uniform, necessary in showing my allegiance. But damn! Furry mauve knee socks?! Other kids would ask what I was suppose to be. Haha. Later I would find my people. Sad there aren’t any images from this time. Hilarious. I can only imagine what my teachers must have thought. Ha. I went to every Bowie tour coming through the SF Bay Area. At the moment I am working on a commission to honour Bowie, for a patron-friend. Pics coming soon! Stay odd. Previous Post how many people lie instead of talking tall?